Just months after the rally, Joy Baluch, Port Augusta’s long-serving and beloved mayor, died aged 80. With her shock of red hair and trademark leather pants, Baluch had become one of the most vocal, not to mention recognisable, advocates of the building of a solar thermal plant in her home town. Sixteen years before her death, Baluch had lost her husband, Teofil, to a cancer that she attributed to his time as a worker in one of Port Augusta’s coal-fired power stations. The Repower Port Augusta campaign – led by an alliance of groups including Climate Emergency Action Network (CLEAN SA), Beyond Zero Emissions, 100% Renewables, Australian Youth Climate Coalition (AYCC), Doctors for the Environment Australia, and Conservation Council of SA – has been tinged with sadness since Baluch’s death, but her presence continues to loom large over developments in the fight to make South Australia the solar state. Two weeks ago, electricity and gas supplier Alinta Energy announced it was initiating a $2.3 million ‘full feasibility study of solar thermal and hybrid generation options’ in Port Augusta. There was applause – if of a somewhat muted kind – within the Repower groups, but doubts remain as to the level of Alinta’s commitment to a solar future for Port Augusta. The company owns and manages the Leigh Creek Coalfield that supplies all of the coal for the city’s power stations. South Australia’s Labor government, currently led by Jay Weatherill, has not significantly come to the party, and an imminent state election has seen the issue politically mothballed, not to mention overshadowed by the furore over Holden’s controversial withdrawal from Adelaide. I put some questions to Lisa Lumsden, Repower Port Augusta chairperson, shortly after Alinta’s announcement. Ben Brooker: The Alinta feasibility study will not be complete for two years. Do you think supporters of the Repower campaign will feel frustrated by this length of time? Is there a sense that the company is trying to delay the issue out of existence? Lisa Lumsden: It is a long time, but Alinta have contributed a million dollars to the study as well which indicates that they are taking it seriously. [The remainder of the $2.3 million is made up of funds from the Australian Renewable Energy Agency’s Emerging Renewables Program and the South Australian government’s Enterprise Zone Fund.] The big question for us is will the state and federal governments make sure funding is available for actually building a project when this study is done? BB: Is it disappointing to you, and fellow members of the campaign, that a hybrid plant is under consideration? LL: Repower Port Augusta doesn’t support a hybrid plant; it is just putting an old polluting power station on life support and does nothing to address the health concerns our community has from living next to a coal-fired power station. BB: What impact, if any, do you feel the upcoming state elections have had/will have on the Repower campaign? LL: We are going to be focusing on the state election in a big way. 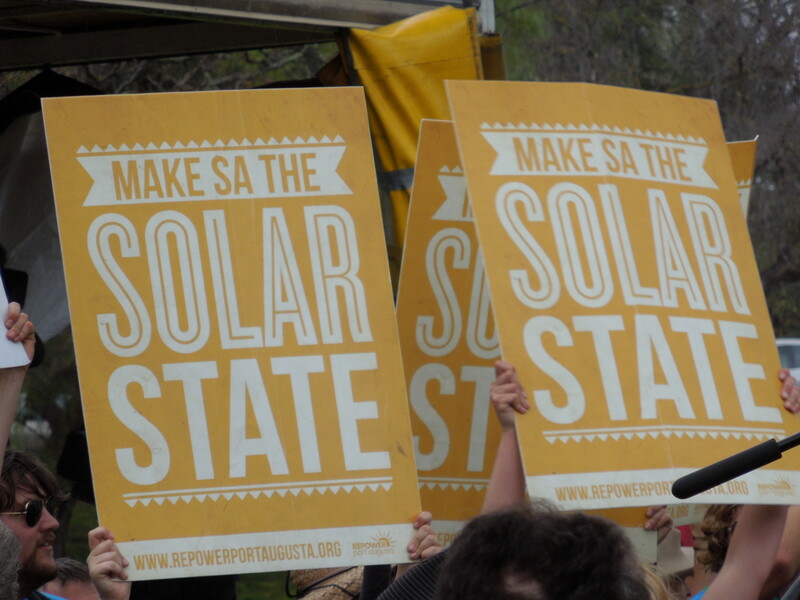 We need Jay Weatherill and Steven Marshall [state Liberal leader] to step up and commit to funding solar thermal with storage in Port Augusta and tell South Australians how they would do it. BB: Is it fair to characterize the Repower alliance’s position as that the real issue is money rather than feasibility? If this is the case, what are your feelings about the current Government’s views on this? LL: Solar thermal plants with storage operate around the world; the latest plant commissioned is in Chile just recently. We know these plants work. What we need is government support for the industry to get up in Australia and the Federal Government’s attacks on renewable energy really don’t help the situation. We want to see both State and Federal Governments investing in the future of our community and the future of renewable energy in Australia. BB: There has been strong grassroots support for a solar thermal plant at Port Augusta. Now that the feasibility study has been announced, what should the campaign’s focus be? In other words, where to from here for the next two years? 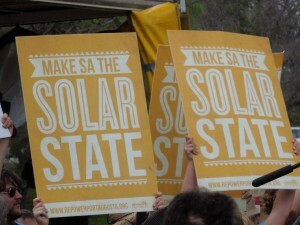 Do you feel optimistic about the future of solar thermal in SA? LL: Our focus right now is on the state election and getting concrete funding commitments before then. We will then need to assess the situation and how we can make sure solar thermal happens in Port Augusta. We’re optimistic, this feasibility study is a big step and South Australia is perfectly placed for a strong solar thermal industry. The community support is there, now we need Government to step up and make it happen. For more information, go to repowerportaugusta.org. This entry was posted in Activism, Climate change, Environment, Renewable Energy and tagged activism, AYCC, climate change, environment, renewable energy, solar power by Ben Brooker. Bookmark the permalink. A feasibility study… 2 years? That was for for putting an aluminium smelter on Mars, right? Of course it’s a delaying tactic. The silver lining is the $1m, which shows how desperate they are, how far they are prepared to go to buy some time, if not credibility. Many years ago, I used to travel from time to time into the mallee, where I would see what I was told were willy willies, little dust devils meandering about the plains. We have now a season of those, in terms of environmental politics. The hydrocarbon lobby and various governments, including our federal and some state, are pulling all kinds of manoeuvres and scams, trying to derail or hinder the irresistible progress of renewables. Much good it will do them. The people of PA just need to stay resolute like a bulldog, and sink their teeth into the groin of any politician or corporate type who tries talk them down or sell them short with some half-arsed half-way half-house.